If you have flippers and spend time gliding through U.S. waters, there’s at least one reason to celebrate today. New research suggests that more than three quarters of marine mammal and sea turtle populations listed under the Endangered Species Act have significantly rebounded following listing. The study highlights just how successful the ESA has been in driving the recovery of species that were flirting with extinction a generation or two ago. The Endangered Species Act of 1973 is the key environmental law that grants the federal government the power to protect endangered and threatened species and habitats crucial to those species’ survival. Researchers have evaluated the ESA’s impact on protected species before, but most of these analyses have either been broadly focused on thousands of species, or on specific, land-based groups of organisms, like plants or birds. Information on the ESA’s relative success in protecting large marine mammals—perhaps the most charismatic faces among the U.S.’s pantheon of threatened species—is lacking. So, a team of researchers at the Center of Biological Diversity decided to fill the knowledge gap, examining how populations of sea turtles and marine mammals have fared since listing under ESA. Their findings, published today in the journal PLOS ONE, are an assessment not only of population trends, but also the success of specific conservation actions promoted by the ESA. “We were trying to determine—for all the marine mammals and sea turtles that are listed—where do those populations actually benefit the most from ESA listing?”, said lead study author Abel Valdivia, formerly a marine scientist at the Center for Biological Diversity and now a senior manager in monitoring and evaluation at RARE. 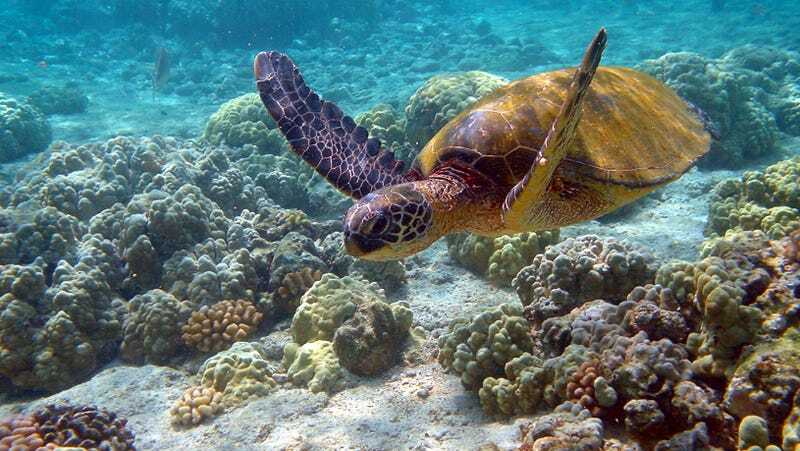 The team started by selecting populations of sea turtles and marine mammals listed under the ESA in a database curated by the National Marine Fisheries Service and the U.S. Fish and Wildlife Service. They excluded everything that was listed more recently than 2012, to make sure there was enough time to see any conservation effects (notably, this is also the reason sharks and rays were excluded from the study; so many have been listed in only the last few years). Then, using data from scientific papers and government reports, Valdivia and his team generated models that showed the species’ population sizes over time, and their current trajectories and recovery statuses. They did this for 23 populations of 14 marine mammal species and eight populations of five sea turtle species. Their results revealed that the ESA is really damn good at protecting these animals. Among marine mammal populations, 78 percent showed a significant increase since ESA listing. For turtles, it was 75 percent. No turtle populations experienced decline, and only two marine mammal populations deflated after listing. The rest experienced no real change in size. Importantly, the team found that populations that had been listed for over 20 years were more likely to have significantly increased their numbers, showing that the ESA’s benefits are cumulative. “The longer [the species] stay in the Endangered Species Act, the better chance they have to recover,” Valdivia said. For the minority that had an unchanging status, Valdivia thinks these some of these might be populations that have become stable at their current size for now. The findings show that certain species are doing particularly well, like the bowhead whale and the California sea otter, the latter of which numbered only a handful less than a century ago following devastation by the fur trade. The green sea turtle has also experienced a glorious recovery, in Florida especially. “Since 2013, every single year, there have been record high numbers nesting [in Florida],” Valdivia said. The few populations that have not done so hot often suffer food insecurity in their habitats. Valdivia cited the slow-motion starvation and extinction of the Pacific Northwest’s southern resident killer whale population as a sober example. That said, it’s the nuggets of “conservation optimism” that Valdivia feels are critical to take away from the study. “This is a positive story in a background of all-negative news in the past 10 years due to all the threats in the marine environment—climate change, overfishing, pollution,” he said. While no law is perfect, it’s clear that given enough additional time to execute its goals, the ESA is likely to drive the recovery of even more populations. Unfortunately, ESA has been facing an increasingly dire series of attacks in recent months and years from the Trump administration and congressional Republicans. Most notably, last July, the Trump administration proposed a major “tinkering” with the Endangered Species Act, including a rule change that would effectively nullify current “no take” regulations surrounding many threatened species, opening them up to being killed or having their habitats destroyed, pre-ESA style. These no take rules are probably the primary factor behind any of the recovery of the ESA-listed species in the new study, says Valdivia. Another proposed change would empower regulators to consider the local economic impact of a potential species listing before deciding whether or not to list it, instead of basing decisions entirely on relevant scientific information. There have also been motions from congressional Republicans to weaken the reach of the ESA piece by piece, species by species. In September, House Republicans—in response to court rulings protecting grizzlies and wolves—moved to make changes to the ESA itself, including giving priority to science submitted by state and local governments over the federal government’s when determining a species’ protection needs, dramatically weakening the Act. In November, they then passed a bill specifically to end federal protections for wolves in the lower 48 (the bill never made it out of the Senate). There’s even the possibility that the agencies entrusted to do the legwork of evaluating habitats for imperiled species are failing to do so. The study’s findings show that the Endangered Species Act has been a savior for many of our most beloved marine megafauna. It’s also a powerful reminder of what we could lose if the Act is hamstrung.